A district can take many steps to ensure that its students are protected from harmful, obscene, or otherwise unworthy websites. It can establish guidelines for appropriate Internet usage, create acceptable use policies, or provide training for teachers. Some districts choose to develop cybersafety curricula or download course materials from such websites as i-SAFE (www.isafe.org). But perhaps the most effective way to make sure children don’t access inappropriate websites is to use a filtering product. We’ve talked with a few districts to see how they determined which of the hundreds of filtering options best fit their district’s needs. What do you use for filtering? Pricing depends on a variety of factors, ranging from $2 to $20 per seat. The appliance starts at $3,000. Why did your district buy a filtering product? How did you choose this product? According to Culbert, 8e6 is perfect for large-size districts. “Some vendors would make us have to place a filter at each school. We’d have to manage 164 different content filters—a real nightmare,” he says. Instead, he has a box in his office and one as a backup to handle all the traffic from 150,000 users. “Try as they might, the kids are not bypassing it,” he says. “Make it cheaper!” laughs Culbert. How did the product resolve your district’s Internet-related concerns? Pricing is based on bandwidth. Special promotions are available. Driscoll liked DeepNines’ network-monitoring product, so he evaluated the filtering product and liked what he saw. “The price was right and it integrated with our products,” he says. “The service has been great and the company has helped a lot in setting it up” says Driscoll. “It’s a full-featured product with a price at the fraction of the competitors.” He likes DeepNines’ “fine-tuned granular filtering rules that are based on different types of users,” which he says other products did not let him do. In addition, the product integrates with his active directory. Driscoll appreciates having the capability to override the rules as needed, which is one of his requirements. “Part of my fear is being able to afford it long term and we can afford this,” he adds. Total Traffic Control—which includes Web Access Manager, Network Traffic Manager, Security Manager, and Email Manager—is $10 per workstation per year.Why did your district buy a filtering product? “We had to because of e-Rate rules and CIPA compliance,” says James Hanrahan, systems support specialist. The district was already using Lightspeed for filtering spam. When the license renewal came up for the previous Internet filter, they decided to standardize with Lightspeed products. “Its reliability and ease of configuration,” says Hanrahan. “It isn’t a proxy filter–it filters the traffic on the network so it’s hard for kids to get around.” There is no getting around the filter, he says, even if students bring in own their own computers. Hanrahan also likes Lightspeed Systems’ wiki, on which he can request features. He says the company is very responsive and interactive with its customers. Pricing $39.99; educational and volume discounts available. Why did your school buy a filtering product? “We participate in e-Rate and are required by law to provide it. Also, we want to keep students safe online,” says Dawn Shields, director of technology. Tuscarora’s main office is in central Pennyslvania, with satellite offices throughout the state. Students take classes on site, online, and remotely. Astaro: Astaro Web Gateway—an all-in-one appliance—lets IT departments detect malware, filter URLs, and more with a browser-based user interface. Bloxx: Thanks to the company’s patented Tru-View Technology Internet filtering software, the Bloxx TVT-Range of web-filtering appliances monitor and block Internet usage, and beat anonymous proxies and protect students. 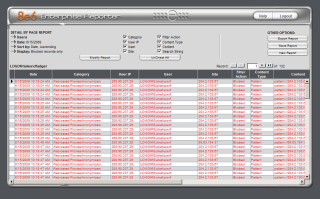 Centipede Networks: Centipede Networks WebFilter Pro, a content-filtering system, includes 23 categories of filtering as well as reporting and traffic analysis. ChildWebGuardian: ChildWebGuardian version 4.2 analyzes pagecontent for forbidden phrases, blocks sites, controls game play, and more. CiPAFilter: CIPAFilter’s Content Filter was developed by feedback from school IT directors. It features a set-and-forget system that does not over block sites and prevents use of anonymous proxy servers and circumvention. CYBERsitter: CYBERsitter version 10 keeps students safe and cannot be disabled by even the savviest of students. Fortinet: Fortinet web filtering is part of all FortiGate and FortiWifi applicances. It blocks access to harmful, inappropriate, and dangerous websites to help schools enforce CIPA rules and Internet usage policies. iPrism: iPrism Web Filter, designed for schools, features proprietary kernel-level filtering—unique to this product. It also offers comprehensive reporting, more than 80 customizable categories, and antivirus network protection. McAfee: McAfee SmartFilter’s TrustedSource database has more than 25 million blockable websites in more than 90 categories. The product lets IT directors designate users who can override the filter for a specified time, exempt sites for groups or individuals to access, and create custom categories. Net Nanny: Net Nanny 6.0 and Net Nanny for Mac 2.0 have enhanced network administration tools to better help schools block inappropriate content such as hate sites, questionable chat rooms, gambling and gaming sites, and more. Netsweeper: Netsweeper filters and/or blocks access to websites by reviewing and categorizing new sites in real time with an artificial intelligence-based system. Pearl Software: Website•Echo is a standalone module contained within Pearl Echo•Suite that lets schools monitor and control access to specific sites or general categories. Websense: With Websense Web Filter (formerly Websense Enterprise), schools can block websites, stop students from downloading malicious code, and protect users from inappropriate information. -- Ellen Ullman is a freelance writer specializing in education and technology.